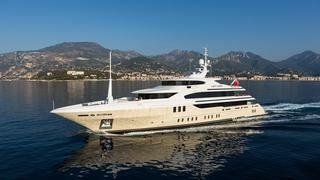 As designers and owner’s representatives on 56-metre Benetti Lady Candy, Captain Paul Brackley, engineer Brett Mitchell and the rest of the team at Central Yacht used the ethos of ‘form follows function’ to develop a highly efficient design, which improves service and onboard experience. It’s evident in every aspect of the yacht, from the stowage of crockery to what guests hear, see and smell, from the exterior styling to – perhaps most fundamentally – the layout. Captain Brackley (also captain of Lady Candy) believes the aft of a yacht, commonly the location of the tender garage, is the roughest place from which to launch a boat. He also feels the water level aft is one of the loveliest spots on board to sit, ‘I think it’s much nicer than seeing the ocean in front, it’s more calming, more relaxing to watch the wake,’ he says. Instead of an aft garage common on yachts of this size, Brackley designed an enclosed aft beach club with a bar, comfortable seating and ‘portholes (rather than windows) for safety, because we are at water level’ for gazing at that wake. To starboard is a gym separated from the social space by a glass partition. Indoor stairs as well as exterior ones mean the beach club is usable even during bad weather or in a marina. The owner’s suite has instead been placed on the upper deck aft and it is nearly matched in size and comfort by the VIP suite forward. 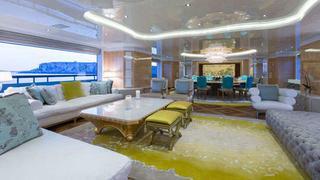 While private, the boat was originally designed with charter in mind and this arrangement would avoid two principals arguing over who gets the best cabin. 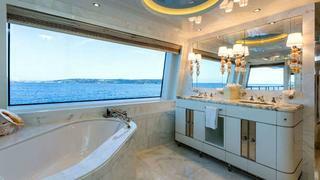 The owner’s suite aft is a flexible space. Forward is a comfortable seating area with a fireplace and bar, and alongside it an office – both spaces well lit through huge windows. 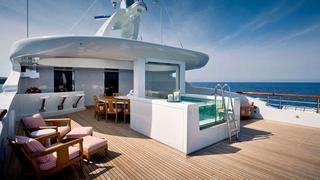 Aft through the office is a dressing room then the cabin itself, looking on to a large private terrace. Shoji screen-inspired sliding doors – two glass planes with a layer of light fabric pressed within them – can sequester all these spaces into an impressive owner’s apartment, while still allowing light through. The office and cabin can also be screened from the sitting room. Alternatively, the cabin and dressing room of the suite can be screened off and the office and sitting room opened up to become shared spaces with the VIP. But just as considered as the positioning of spaces is the practical planning within them. This includes keeping spaces bright: between the two suites and separated from the lobby by glass is a massage room with a long picture window, which spills daylight into the lobby and through the shoji doors. 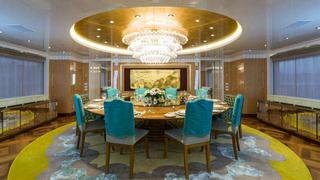 It also involves keeping accommodation private: the entrance hall in the VIP and the sitting room in the owner’s suite are both arranged so that you don’t see the cabin beds upon entering, while the VIP’s forward terrace offers views out but is largely invisible from the crew’s private foredeck. Brackley also employs design tricks to imbue spaces with a desired atmosphere: the owner’s deck aft has a residential feeling of solidity and substance. ‘The balcony cut-down is symmetrical, very square, much more like a house than a yacht,’ says Brackley. Downstairs in the main social areas such planning is also in evidence, generally to improve service. Between the practical galley and the open-plan main and dining saloons, a dogleg corridor prevents kitchen noise reaching guests’ ears. Meanwhile, often-accessed technical spaces throughout the boat, such as fan coils and lighting controls, have been put behind easy-to-open panels to save man hours. Even up on the relaxed sun deck, an exacting attitude to service is at work. In a pantry just forward of the outdoor area a dumbwaiter carries dirty dishes to a dishwasher next to the crockery store on the upper deck, so they can be immediately put away. Echoing the main saloon planning for kitchen/guest separation, an extractor fan on the barbecue in the wet bar ensures guests aren’t bothered by cooking smells. 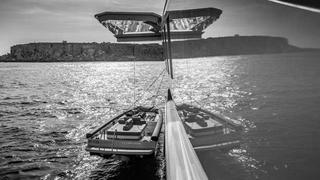 The aft sun deck itself is topped with a loop of superstructure that can be rigged with a pavilion-style tent for shade over the dining table, with four lights in the superstructure and a spa pool aft. This spa pool is separated from the dining table by a glass screen, which gives an open feeling while stopping water splashing on diners. For extra effect a waterfall spills into the pool from the top of the glass, which in the evening can be used as a screen for films or music videos from a projector built into the superstructure. 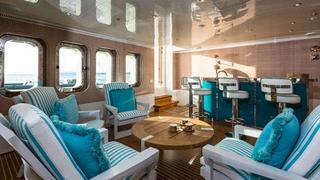 Forward on the same deck, the wheelhouse is as well planned as you’d expect from such an exacting captain. ‘The windscreen is angled slightly out – it’s not noticeable from outside but you don’t get reflections from console lights,’ he says. For the same reason the warning LED lights often found on the aft wall of a wheelhouse have been relocated. 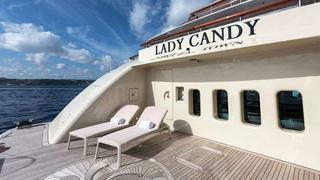 The interior design of Lady Candy was planned by Central Yacht and decorated by Pamela Babey of US home and commercial decorator BAMO Inc. It is Asian influenced and features light woods such as birch and limed oak, with neutral tones and greens and yellows in carpets and glassware. Touches of gold, such as the painted leather wall-mounted artwork in the dining saloon, plus a variety of marbles in dayheads, lobbies and en suites, add a richer element. The scheme varies in tone: in the lower deck guest cabins it is simple and neutral; in the main and VIPs it is more decorative. No less attention was paid to the exterior. Brackley minimised style lines to keep the yacht from looking dated in years to come. The cream shade ‘moondust’ was chosen for a paint job when the owner saw a model of the yacht painted in that shade, with white touches and black strips of tinted windows for contrast. These windows are flush for a sleek look, maximising interior spaces and for easy cleaning inside and out (a job made safer on the exterior by subtle footholds built into the structure). 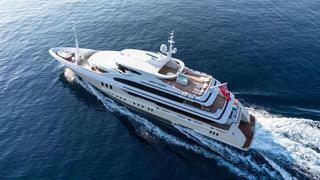 It certainly seems that together with Benetti’s craftsmanship, Central Yacht’s thousands of calculations have added up to a very fine superyacht.